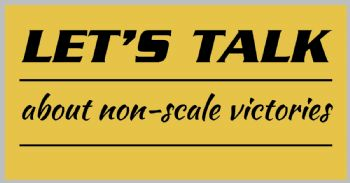 Below is the accumulation of everyone's non-scale-victories from my previous blog. WOW! It was overwhelming and encouraging to see everyone elses responses. What motivators you all are. I can ride my bike as far as my kids want to go, i can get things out of a lower cupboard more easily, I don't avoid the stairs, I can play badminton, and I dont avoid the mirror. I am eating more veggies. I am trying new foods. I am slowly gaining more confidence. I am comfortable speaking in a group. My meds have been reduced. This is a great blog! Lots to think about. 2. I am learning to resist sugar. 3. I drink lots more water. 4. I gave up soda pop! 5. I have learned so much about myself on my journey so far. You have great NSVs. Congratulations on all your accomplishments. 5. I have lost many inches off my body measurements. I can light a decent amount of weights. 2. I have improved my sleep. 3. I have increased my water consumption. 4. I am eating more mindfully. 5. I am planning to ride my bike more this summer. 1. I became a Marine. 2. I stayed married for 28.5 years when he passed away. 3. I raised two strong successful children. 4. I graduated with my BS degree. 5. I held a state license as a Licensed Drug and Alcohol counselor. 6. I have helped raise about 25 grand children. 7. I now have 7 great grand kids with 2 or more on the way. 8. I try to live life on a positive grateful attitude. 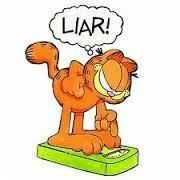 I have noticed some changes such as clothes, ease in walking, breathing, etc., but I still keep my eye on the scale mostly. Even though I have lost 62#, I am still looking for more. I have to learn to take advice such as yours. For me, it is and always has been the number on the scale. 2. I can sleep better. No sleep apnea. 4. I can wipe without difficulty! 5. I no longer need a seat belt extender. 6. I can fit into an airline seat without overlapping. 7. Went from size 30/32 Pants to size 12. 8. I can drive for more than a few minutes without falling asleep. 9. Blood pressure is well under control. 10. I don't have to shop at any specialty stores. 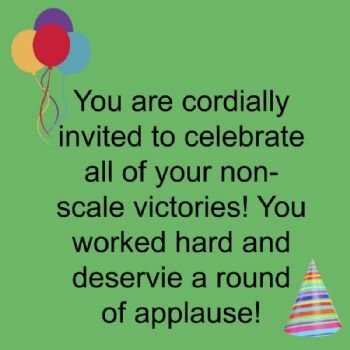 Woo Hoo you for all of your accomplishments and NSV!! Love the blog. 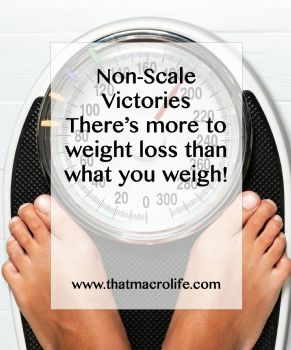 Thanks for the reminder of the non-scale accomplishment. There are so many. I just have one important one that all others pales beside. Regular movement keeps me out of a wheelchair. 2. I can sleep better..(I don't need 5 pillows to prop me up). 3. I am able to touch my toes. 5. I can wipe without difficulty! 1. I can walk up and down hills without stopping or slowing to a crawl. 2. Found out I really enjoy trail walking. 3. My dogs love me more! 4. My summer clothes were loose this year. 5. My GI is much happier since I changed my diet. So happy for you all, I'm getting there. 10. Have been doing this for 10 yrs and there are many more NSV's that seem really normal to me now but, these are just a few. Spark has become such a habit with me I don't think I could ever see myself not doing it. I have several but here are my top five. 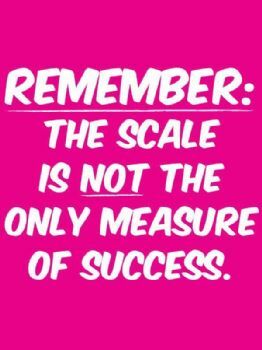 Because my weight loss journey is more about my health than the number on the scale. I am very happy with my weight loss but I am estastic about my improved health numbers. 1.High cholesterol is no more I control it with exercise and nutrition, a powerful one/two punch! 3. I met the inner athlete who lives inside me (beats morbidly obese & falling) it only took 57 years! 5. I do not recognize the girl in the mirror, I’m happily learning more about her every day. This was suuuuuuch an uplifting way to begin today, thank you for this. I love measure yourself in "contentment and laughter." This is SO true! for your blog today. 5) no longer have to take high blood pressure medication! good challenge and you have GREAT NSV's. All of mine have been named!! Isn't that awesome!! I can add that my DH calls me "skinny!" 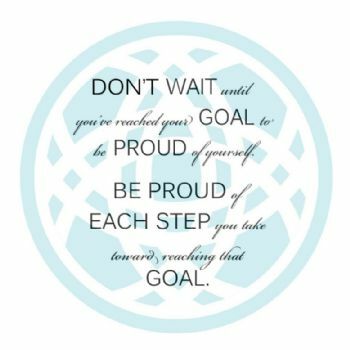 Incredible blog, thank you for sharing your NSVs! Hey Spark People, we need more blogs like this!!!! 2. I've lost 3 sizes! 4. I have more energy! 5. My wedding ring fits! I am beginning my journey so none yet!! This blog is GREAT … I mean it!! And your NSV are Awesome!!! or has NO health benefits. Great blog! Thx for sharing!! 1. I can Zumba for an hour without being winded! 3. My a1c is below normal! My last blood test the PA said I had the blood of a 22 year old! 4. I am an inspiration to many! 6-18-18 Hummers fill my life with joy. I have several that 'talk' to me from our upstairs bedroom! So darling!!!! 9. I can do more reps.
10, I have set other goals. 18. I have not had migraines. 2. Can shop in a regular store for clothing. 3. GI health is much better. 4. Blood sugar is under control! 6. I am able to touch my toes! 7. I am able to SEE my toes. 8. Can navigate the stairs in my home much more comfortably. Let's continue to give ourselves a congratulations for everything we do. Wow!!! Amazing blog!!!! Thanks for sharing!!!! Wow. Thanks for sharing. Reading it is energizing. More than Impressive!!! for all! I hope this one will be chosen as a Featured Blog. It's so inspiring to see these NSVs, and I can just feel peoples' delight in their answers. Thanks for sharing! 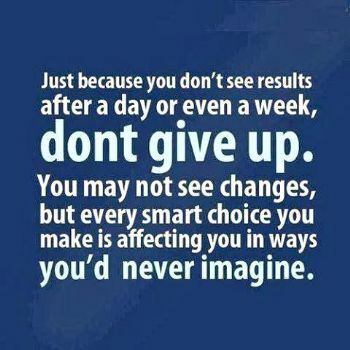 So motivating!! Keep on sparking!!! It makes me feel excited to hear about all these NSVs.